Spend enough time in the outdoor world, watching outdoor athletes and you will begin to ask some basic questions: What motivates a person to run 100 miles, to mountain bike for seven days straight or to climb a sheer rock wall? How does one overcome deep-seeded fears to take on these challenges? Everyone has a friend who they think is “crazy,” who seems to take their passions to the extreme. Outdoor culture and social media revere our athletes and their accomplishments. Most people are inspired by stories of outdoor heroes overcoming big challenges because it gives us hope. But so few people who play outdoors actually become extreme athletes. Why? Obviously, the biggest thing that stops many of us from moving forward, from being extreme athletes or even extreme in our own lives, is fear. Fear can wear many masks; fear of the unknown, fear of not being good enough, fear of injury, fear of looking stupid. Anytime we push our boundaries, we risk facing the consequences of our fears if we don’t achieve that shining objective. The difference between facing failure and being beaten by it comes down to our willingness to take a risk, our readiness to try and fail. I understand this dynamic. I’m a professional ultra-endurance mountain biker and take on the world’s hardest multi-day races from Colorado to Colombia to Nepal. I won the WEMBO 24-Hour World Mountain Bike Championship in 2015. I am most likely someone’s crazy friend. I’ve been called crazy (and not just because of my last name). I’ve had people ask me why I would even want to take on some of these races and suffer through the experiences I’ve had. What they need to know is that the challenges I’ve faced on my bike have led to a quiet confidence in other areas of my life, from starting different business ventures to simply being comfortable embracing discomfort. Long rides feed my hunger for personal growth. When it comes down to it, the biggest challenges of my life have been the most meaningful. But these deeper questions about fear and motivation still fascinate me, so I decided to seek out and interview fellow extreme athletes from different sports to understand how we handle our fears, to determine what drives us, and how this obesession carries us through day-to-day. The big thing you need to understand about fear, and the unknown, is that it can be a great motivator and teacher. Competing in a sport where you never know what you might face, Obstacle Course Racing World Champion Lindsay Webster says, “You never know what to expect in these races… you might have to swim through glacial water, you might fail an obstacle, or your grip strength might give out on you during a set of monkey bars. The list of things I’ve had to overcome during races is endless. You just have to accept whatever the race throws at you, and find ways to push on without letting it get you down.” The challenges of sport teach us that we always have the choice to continue moving forward. Based on my research, many high achieving “extreme” athletes are focused on growth rather than outcomes, and they find benefits in fear. As a result, their perception of their own ability and willingness to take risks leads to greater overall success. Each time we try something new with a growth mindset, it moves the needle of what we think is possible. The hardest part is getting started because confidence and self-belief are built upon experience. Amber also knows about failure. “My first attempt at a Tahoe Rim Trail FKT (fastest known time), I stopped at about 90 miles, frozen and physically broken,” she says. “I learned so much during that ‘failure.’ I learned not only about myself, but also about how I would train differently the next time and different gear I’d bring. Each time I’m out there, I learn more and grow as an athlete and a person. I think the only way to truly fail at something is to not try.” Amber is right. If we never try, we will never have new experiences. What about fear of falling, of actual physical injury or death? Shauna Coxsey, a rock climber and two-time winner of the IFSC Bouldering World Cup says that fear doesn’t go away, no matter how accomplished you are. “Fear is natural. It’s something we all experience. The ability to deal is a skill that can be learned and trained. I’m able to push myself out of my comfort zone. I still get scared and nervous but I have learned how to use and control these emotions.” However, there is a balance between helpful fear and fear that is so far beyond your comfort zone that you shouldn’t be doing it. Another world class rock climber, Sierra Blair-Coyle, can relate to experiences and achievements showing us that we are more capable than we believe. “It can definitely be stressful, but climbing has ultimately taught me that I am capable of anything I set my mind to and put in the hard work to accomplish,” she says. And that’s a great point. Sports teach us the value of hard work. What about when something does go wrong, like falling 150 feet off a mountain and being hospitalized for eight days? 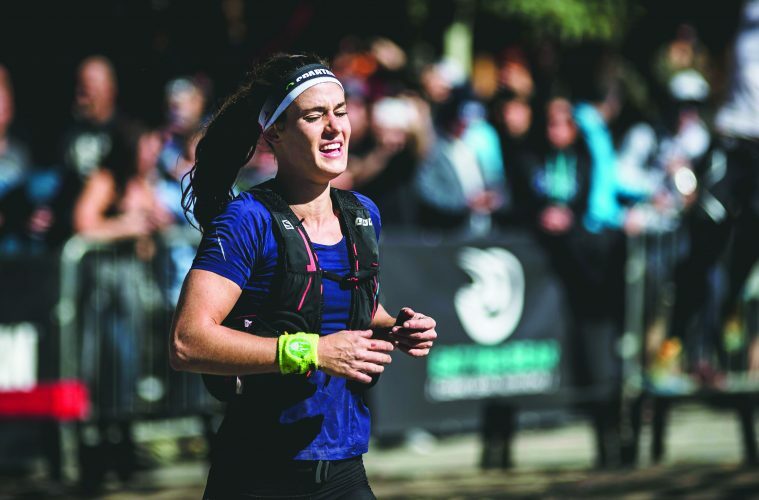 That happened last year to Hillary “Hillygoat” Allen, another ultrarunner who thrives on extreme challenges, when she took a near-fatal fall in the middle of Norway’s grueling Hamperokken Skyrace 50K. We’ve all experienced injury and wanted to clam up when our confidence was shot. But, believe me, ignoring those feelings will not bring your confidence back. “I acknowledge that my fears are valid and real, that what I’m going through is hard, and then I make a choice to keep showing up, to keep trying and to keep trying to become a better person and a better athlete,” says Allen. The lesson? Only by showing up do we overcome failure. What have you been putting off doing because of fear or intimidation? All of these strong and inspiring women are great examples when it comes to how we can learn to move beyond that fear. They prove the only thing holding us back is ourselves. Their example shows us we have the power to go for the challenges and adventures that we dream of trying. They demonstrate that an ordinary person (every athlete starts out as an ordinary person) has the personal power to become extraordinary. So, what are you waiting for?